"Superb picture book biography." SLJ.
" Schubert knows just how to write for this audience." Horn Book. "Schubert gives depth and compassion to a performer..." PW. A Tablet Magazine Best Picture Book of the Year. 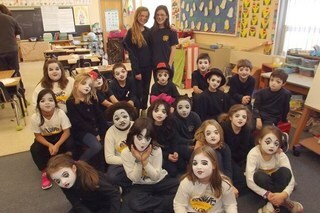 Readers mime at St. Francis Xavier School in Winooski, VT.
A comprehensive site about mime. MONSIEUR MARCEAU: ACTOR WITHOUT WORDS. Illustrated by Gerard DuBois. Porter/Flashpoint/Roaring Brook Press, 2012. (Cannot seem to add accent over the 'e' in Gerard.) A picture book biography of the greatest mime who ever lived. Winner of the Norman A. Sugarman Award for outstanding children's biography! Winner of the Orbis Pictus Award for Outstanding Nonfiction from the National Council of Teachers of English! The Orbis Pictus Award announcement. A starred review from Booklist! A starred review from Kirkus! A starred review from SLJ! On the COVER of the July 15 print issue of Kirkus! A NCSS (National Council for the Social Studies) Notable Trade Book for 2013! Grades 2-4. 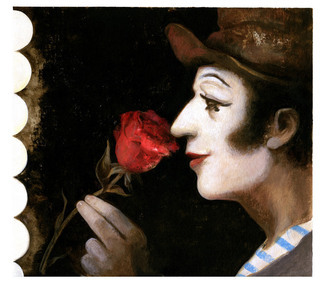 This handsome picture book tells the story of Marcel Marceau, the maestro of mime. Born in France, he was 16 when WWII broke out and shifted his life. He changed his last name to hide his Jewish identity and worked with the French underground. After the war, he studied mime and created his signature character, Bip. Quotes from Marceau connect the silence of those who returned from concentration camps (where his father had died) with his own choice of silence on stage. Schubert distills his complex life story into a short, pithy text that reads aloud well. While she discusses his art and his worldwide fame, a series of images bring Marceau’s movements and emotions to life on the page. Well thought out and varied in composition, DuBois’ paintings illustrate the text literally while expanding it visually and emotionally, particularly in the haunting sequence of narrative scenes during the war. 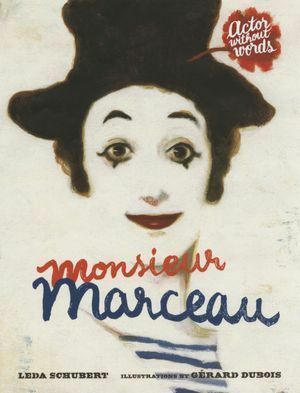 An afterword offers a somewhat more detailed account of Marceau’s life and suggests activities for children who would like to try mime. Even readers with an unfavorable view of mime as a medium will find plenty to admire in this picture-book biography of the man behind the whiteface makeup. "There are so many reasons to love this book—the poetry of the language, the expressiveness of the art. For me Monsieur Marceau demonstrates what the perfect picture book can accomplish: words and text working together to provide a unique reading experience. Marceau and his performances come alive in this slim volume. If you or the children in your life appreciate the performing arts, you will delight in sharing this book." A lovely review from the CLN here. Click. Lynn Rutan and Cindy Dobrez review MONSIEUR MARCEAU for BooklistOnline! "...Schubert uses an economy of beautifully turned phrases to introduce children to this one-of-a-kind performer. Bravo." Lynn: "Schubert’s text and DuBois’ illustrations have captured the essence of Marceau and my squashed hat is off to them both!" A lovely review from the International Reading Association. Click here to read a Q&A about the book on the Kirkus blog. Read more about MONSIEUR MARCEAU on Cynthia Leitich Smith's website, here. "Gr 1-3–It is fitting that this superb picture-book biography is short on words and long on visuals. The spare text marvelously captures the essence of the artist, depicting a man whose choice to be silent was born of an awareness of the damages of war. Born in 1923 to a musical family who lived near the French/German border, Marceau idolized Charlie Chaplin and began emulating him at a young age. When World War II broke out, residents of Strasbourg were forced to leave their homes, and later Marceau joined the French Resistance. After the war, he changed his original surname, Mangel, to Marceau “so that people wouldn’t know he was Jewish.” Marceau studied mime and created the character Bip, whose smashed stovepipe hat, white makeup, red carnation, and sad eyes became known the world over. The stunning oil pastel paintings are as somber, joyful, and expressive as the man himself; they depict him fighting a bull, chasing butterflies, or crumbling in sadness. Covering much the same ground as Gloria Spielman’s Marcel Marceau (Lerner, 2011) but in a more compelling manner, this exquisite book has an informative afterword and a page on the art of miming. A noteworthy choice for all collections.–Teri Markson, Los Angeles Public Library"
Audiences thrilled to his mesmerizing performances, in which he spoke through his expressive body without uttering a single word. 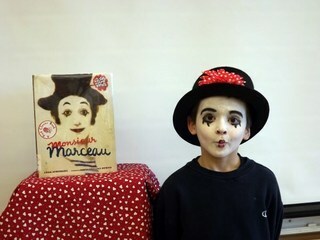 Marceau was the world’s most popular and beloved mime. Born in France, he grew up watching and imitating Charlie Chaplin, star of silent films. World War II intruded and turned the Jewish teen into a war hero. At war’s end, he created Bip, his alter ego, who with makeup and costume “walks against the wind, but there is no wind.” Schubert’s spare text is both poetic and dramatic. DuBois’s oil paintings are brilliantly executed and saturated, with textured nuances. Images of Marceau fly across the page, delighting the eye, while close-ups highlight his extraordinary facial expressions. Ordinary paper morphs into stage settings as Marceau dances against white or black backgrounds. One double-page spread depicts a costumed fish with sinuously expressive hands and feet. Another presents seven views of Marceau in movement, updating a series of views of Marceau as a child. The pages set during World War II, in contrast, are a somber palette. Don’t turn the pages too quickly; rather stop and feel the joie de vivre with which the master filled people of all ages all over the world. "...In the first half of the book, DuBois’s (Stories for Young People: Edgar Allan Poe) stately paintings pay homage to Marceau’s bravery. In the second, Schubert details Marceau’s phenomenal success (“He traveled the world—appearing on television and on stage, for presidents and princesses, kings and queens”), and DuBois’s portraits help explain mime to those unfamiliar with it (“He walks against the wind, but there is no wind”). Schubert gives depth and compassion to a performer whose art might otherwise be mistaken for clowning. One afterword provides more information about Marceau; another describes mime and supplies some easy exercises." In my post on Cynthia Leitich Smith's website, I mentioned the photo in the back of the book, and I want to tell you more about it. Finding usable photos of M. Marceau is not easy, and paying for the use of photos in a picture book can be quite expensive. Researching photos, however, is both challenging and fun. I'll save you from all the details. But with wonderful serendipity, I found the perfect photo. Rob Mermin, who is mentioned in the book and was the founder of Circus Smirkus, told me that some Smirkus parents might have something. Why? Because M. Marceau actually came to Vermont and performed in a circus, which he had never done, and that was Circus Smirkus. He also spoke in costume in front of an audience for the first time in his life. I loved the Vermont connection, I loved the heart of the story, and I asked for the name of someone with photos. Robert Sugarman, Rob said. I laughed. Though I've never met Bob Sugarman, I know his wife, Sally. She was Chair of the State Board of Education when I worked at the Department of Ed, and she also joined me on the Dorothy Canfield Fisher book award committee for several years. I spoke to Sally, who spoke to Bob, who said of course and who sent me the photo of my dreams: Marcel Marceau smiling and in costume, holding hands with circus kids, in Vermont. And all I could do in return for Bob and Sally was to send them a copy of the book, which I was very very happy to do. Amazing, yes? Yes! From my hometown paper, the Times-Argus, an interview with moi. Not available to nonsubscribers, so I'm pasting it in. PLAINFIELD — Ushering children into the world of reading has been a lifelong passion for Leda Schubert. Her new book “Monsieur Marceau: Actor Without Words” has just received the Orbis Pictus Award for Outstanding Nonfiction for Children. “They called me up and said, ‘You just won the award.’ I was flabbergasted. I never thought it was a possibility. I knew about it, but it just wasn’t on my radar,” she says. Though Schubert, 67, didn’t expect to write the book, she became fascinated by Marceau’s story after her agent asked her if she might consider writing about the mime. Not knowing much about Marceau, Schubert dove into researching; she bought playbills off eBay, read innumerable books, went through the New York Times archives to read reviews of his performances and read every interview with Marceau that she could get her hands on. “I just went on and on and on, because I wanted to distill all this information into a very simple framework,” she says. Schubert has not always been a children’s book author, despite the dream of wanting to do just that, but books have been central to her life and work. She spent 17 years at the Vermont Department of Education as a school and public library consultant, reviewing and recommending books to the librarians, which she says is a service no other state can provide. She was also the children’s librarian at Kellogg-Hubbard Library in Montpelier. “I was reading everything, and seeing everything and just thinking, ‘I don’t know if I will ever be able to do this, but this is really still what I want to do,’” says Schubert. After a lot of rejection, her first book was published in 2000, a beginning reader series that featured her beloved dog, Winnie. “They’re still my favorites,” she says. Shortly after, she enrolled in the Master of Fine Arts in children’s writing program at Vermont College, originally just to check it out for one semester, as she already had a master’s degree in teaching from Harvard. “I was there for five minutes and decided to go for the degree. I was immersed in that for two years, during which time my second book was published,” she says. Upon her graduation from the program, the college asked her to join the faculty, but she says there was a period of time before she started teaching when the true test of what she had to offer the world of children’s literature occurred. “You’re on your own, and it’s very frightening. You’re used to sending in packets and getting a lot of feedback and having a support team and all of a sudden it’s gone. You have to have a lot of discipline,” she says. She did. Along with the discipline, inspiration struck while flossing her teeth in front of the television. “About halfway through writing, I remembered that when I went to college I took mime. I had almost forgotten it, and then I started thinking that there’s definitely a connection, just as there was with ‘Elephants,’” she says. Schubert had dedicated that book to her parents, among others, who had first taken her to the ballet and the circus. “I read the dedication at a school reading and started to cry in front of all of these kids, because I realized that this book was an homage to my parents and their interest in the arts. You just don’t know — you don’t know where this stuff is coming from, it’s all so inaccessible. It’s fascinating,” she adds. The Orbis Pictus Award is named for Johannes Amos Comenius, who wrote “Orbis Pictus (The World in Pictures)” in 1657; it is considered to be the first book expressly for children. Each year the National Council of Teachers of English singles out one book and up to five honor books for excellence in children’s nonfiction. Schubert’s “Monsieur Marceau” is this year’s distinguished title.